This elegant stool displays unique style and design. Industrial with more vintage accents, the stool features a wood full-back and a cushioned fabric seat. Showcasing tall metal legs, this stool is a wonderful accent for the modern home with retro style. The Industrial 26" Upright Counter Stool with Cushioned Seat by Amisco at Dinette Depot in the Brookfield, Danbury, Newington, Hartford, Connecticut area. Product availability may vary. Contact us for the most current availability on this product. The Industrial collection is a great option if you are looking for Industrial furniture in the Brookfield, Danbury, Newington, Hartford, Connecticut area. 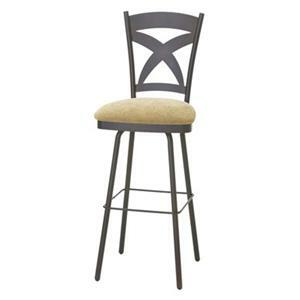 Browse other items in the Industrial collection from Dinette Depot in the Brookfield, Danbury, Newington, Hartford, Connecticut area.